Collisions with animals on the road are an upsetting but inevitable part of driving. However, equipping yourself with knowledge about animal behaviour can lower you chances of hitting an animal. Below you will find out when and where you are more likely to encounter animals and how to react should that happen. Country areas are notorious for encounters with both wild and farm animals. The increased frequency of encounters is due to animals frequenting the areas next to roads. They do this because drainage areas near the roadside create both lush grass and watering holes. You should always be on alert in country areas because of the increased risk - especially at the times outlined below. Warning signs that indicate a high incidence of animal encounters should not be ignored as they have been placed there for your safety. In the areas indicated, reduce your required braking distance and increase your time to react by slowing down. These driving adjustments will better suit the conditions and increase you safety. Naturally you should also be on higher alert to the potential of an animal encounter. Quiet, straight country roads (very common) can lull you into a false sense of security while driving. Sometimes the limited speed can appear too slow for the conditions. You should remember that limits are well-researched and enforced for a reason. The limit that can appear too slow could be there to protect you from a likely encounter with an animal. Always drive within the signed limit to ensure your and your passenger's safety. Wild animals are most active around dawn and dusk. As night falls, nocturnal animals are woken by falling temperatures and begin to hunt. Dawn sees increased temperatures encourage these animals back to their shelter for some rest. The poor lighting at these times combined with more animal activity is a lethal mix. Drivers' ability to detect and react to animals is reduced resulting in far more collisions with animals. Domestic animals (pets) are what you have to worry about in residential areas. The movement of these animals is far harder to anticipate as they don't need to search for food, water, and shelter. Encounters will be random and likely the result of an escape from a yard or a poorly timed adventure from a cat. Their behaviour will be erratic as they don't understand how to keep themselves safe and will instead explore with reckless abandon. Try to effectively scan and remain alert in these areas to ensure the unfortunate is avoided. Low traffic and speed limits doesn't necessarily mean you're perfectly safe, so always be ready to act. Animals you encounter near the road can be scared and startled easily. Slow down when approaching them. They are just trying to find food and water and aren't thinking about the deadly traffic they're very close to. Animals you encounter on the road are unpredictable. They will be startled, scared, and panicked as an oncoming vehicle is an immediate threat to their safety. 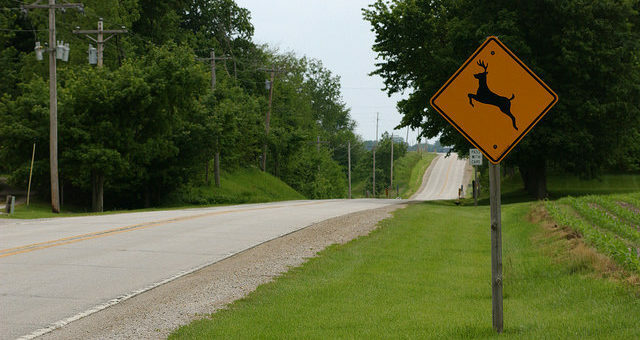 Although they might not be a deer, they will be 'caught in the headlights' unable to effectively make decisions and react. This means you're likely the one who will have to take appropriate action to avoid a collision. If you spot the animal from a distance, slow down immediately. You want to approach the animal at a speed that will allow you to stop easily should that be required. If the animal doesn't leave the road as you approach, carefully and smoothly drive around the animal making an effort not to startle it. The most dangerous situation that can arise is when an animal appears suddenly and is in your path. You won't have the time and space you would otherwise have to react appropriately. As such, you have limited options. The safest action you can take is to stay on course and attempt to slow down safely, without braking too aggressively. You will likely hit the animal, but it's very important not to swerve in this situation. Swerving at speed can cause you to lose control of the car and even roll it. This could result in you moving into oncoming traffic, threatening the lives of you, your passengers or any other road users. When in this situation, everything happens very quickly and it's hard to take everything into account. The most important point to remember is that a human life is more important than an animal's life. You should take steps to avoid colliding with animals, but not if the required action would endanger you, your passengers or any other road users.